I have heard Forte II and they did not sound like what you got.....try different source first . The ones I heard were hooked to a 1970s HK 430 . That tract horn may be showing you stuff thats wrong with your sources that KGs couldn't. But checking those caps would be good idea and a cheap fix. have you tried amps with a little more power? im not familiar with the first watt amps you listed but ive read they are supposed to sound very good for that first watt... but if you listen to fortes loud, like many people do, maybe an amp with more power would help. something with a solid 50-100 watts/ch should drive them closer to their power range. Why not just cut back the treble a wee bit? I did this with my old RB61 IIs. Cut the treble by one, increased bass by 1 and all was fine. i mentioned that in my first post... maybe his pre amp doesnt have treble controls or he considers that "EQ" ? I rebuilt the xover in my forte 2, I spent only a few dollars on caps, EXCEPT! The squaker cap where I think I spent $18 or 20$ Because that is considered the most important. Very happy with the results, although it looks like I need to replace the resistor too after Deans comments. I haven’t tried a ton of ss gear but I just don’t like any that I’ve tried with my Klipsch. I have and eico Hf-81 and a Scott 299b. They just sound good to my ears. I see you have tube options. I haven’t heard quicksilver amps but they get really good reviews. One thing is to make sure those speakers aren’t pointing directly at you. Mine seem better if they are passing slightly to the left and right of my ears. Just my opinion and my experience. I have a pair of Forte I (original model), and I find that the upper midrange (not treble) can sound a bit hot and sharp on some material when volume is on the higher side. I don't find the treble from the tweeter to be too bright or too hot. The upper range of the Forte midrange driver/horn is where hearing is the most sensitive, so that could be a factor in why the upper midrange sounds hot to me when the volume is pushed. For reference, I replaced the mid and tweeter caps with Dayton Precisions, but left the resistor stock (wish I would have replaced it with a Mills). Also, they are being driven by solid state, a Rotel RB-1582 MkII. The original fortes did not have the tractrix mid horn. Some input on the resistors... I was told by bob awhile back that replacing the resistors is not worth it as they have little if any effect on the sound. I didnt question that, was just asking his opinion... but as with anything, opinions vary. The mills resistors are a higher quality part than the cheap cast ones klipsch used so who knows if you can actually hear any difference?? 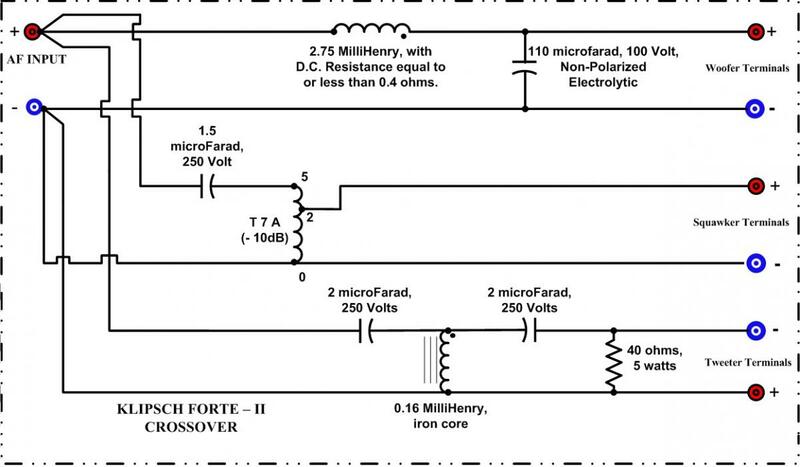 Do you recall specific before and after details of how your Forte II improved after replacing your capacitors? To everyone else, thanksagain for all of your replies. I haven't had time to fuss with them this week, but will be able to over the weekend. Regarding using more powerful amps, I generally listen at an average of 80-ish dB, so I don't need much power. The Quicksilver tube amps I have available are 90 watt per channel monoblocks (KT-150 tubes), and they sound very good, but I have to say that I am really digging the First Watt style sound (kind of a tube-like rich sound but with better bass control than tubes). Regarding EQ, I don't have a preamp that has tone controls. 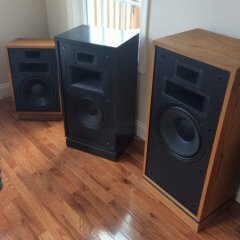 I've been a long-time user of digital room correction as EQ, but since trying out low powered amps and more efficient speakers, I've been trying to see if I can get acceptable results without it. The results with the Forte is very good except for that ouchiness in the upper mids. I'll try some things out this weekend and post back if I make any headway. Thanks again for your posts. If the old capacitors are out of specifications you will notice a difference when you replace them, if they are not that bad you may not notice much or anything at all. Its money well spent to replace them, if not bad now they soon will be as they don't last forever. I never heard the Forte II as being bright in any way but seeing as you owned KG-4's and were used to them i can see where somebody may complain about the Forte II being a bit brighter as it is a 3 way and the crossover points are much different making for a much different presentation. The brightness you speak of is totally natural. Live music is BRIGHT, very bright. Sometimes I’m tempted to slap the sound guy and take over the mixing desk. Just back off the volume some. Remember KLIPSCH loudspeakers are very accurate and only reproduce the source as accurately as possible. Brittle guitar and harmonica send me up the wall. If the caps are old and have some ESR built up, then replacing the caps will increase the energy going to mid and tweeter. If the problem is the sound is too bright, then this "solution" of replacing the caps is suspect (if they need it at all). If the capacitors are out of specification the drivers may be producing sound out of their bandpass causing issues, nobody knows unless they are properly tested. Internet diagnosis is only a crapshoot i hate to say. I found one thing today. When I was moving the speakers this afternoon, I heard something rattling around in one of them, so I decided to take the passive radiator off to have a look. When I put the screwdrivers to the screws in the radiator, they were all very loose in that speaker. The radiator wasn't in tight, so there must have been a fair amount of air leaking out. The rattling was the wires off of the inner side clip and hitting the backs of the drivers, so I guess a previous owner must have been in that speaker doing something and didn't zip up the radiator properly. I clipped the wires back and tightened the radiator and the sound is quite a bit better now. I guess I better check all the other screws. would be a plan to remove all your drivers and stick a few flat tooth picks intro each hole along with a good daub of whit wood glue, trim the tooth picks sticking out of each hole and re install your drivers snug them and later after an hour snug the screws again. This will tighten up all the screws. Would also be a good plan to install fresh closed cell foam gasket material but not 100% necessary but you have to know after decades the gaskets in there are all flat by now. While you have the drivers out you might also plug the holes inside of the cabinet where the grill studs mount to make sure they don't leak use a caulking any kind will do just fill the holes and you will have plugged pretty much any leakage there is. This will have a positive impact. Oh one last thing before you pull your drivers make a discrete mark on the frames (passive also) and when you re install the woofers and the passives rotate them 180 degrees, odds are they have never been rotated and it is about 10 years past due. Every five years ought to keep them well centred. So my expert audiophile engineer description is they just sounded better, ha. Smoother and more enjoyable. Those caps have nearly 30 years on them and they were junk to begin with. I was reminded that I did some of Moray’s mods with the dynamat on the baskets and horns, a bit of poly fil and I used new gasket material on all speakers and passive. I had no idea those quicksilvers had that type of power. I actually had an amp with kt88 tubes at 60 watts a channel, crazy thing is I considered it bright with my chorus ii which have the same squakers and tweets as the forte ii. Enjoyed an el34 amp BUT love my el84 amps, low power warm and sweet. I was told the same thing about resistors which is why the stock ones are still there. But I do trust Deans opinion.